I’ve been getting lots of questions lately about how we structure life around here, or how I get it all done. Really the answer is that I don’t get it all done. But it is worse than that I think – I don’t even try. One of the biggest personal lessons I have learned in housekeeping and child raising is that “done” is a total myth. The more I have adapted to that understanding the better. The more I embrace a lot of my daily work as a cycle that goes on and on instead of discrete tasks that need to be completed, the better. Not only does it relieve a lot of tension surrounding what you are trying to do in a day, but it actually gets much better results. I don’t keep it a secret that I know what it is like to step on jam blobs, or face a mountain of laundry that harbors a mysterious yet hideous smell. It is basically daily that I marvel at the volume of what I sweep. Cleanliness is next to godliness, and I frequently fail in my quest to be in the ballpark of both of those things. But the truth is, it isn’t so much about “getting it all done,” it is about keeping on doing it. Much like sanctification, it is not something at which you arrive. Not anymore. I used to be a person who loved to make everything perfect and then enjoy it without messing it up. God wanted me to get a bigger perspective, so I have a lot of children. I am a very unstructured person by nature. I am not a person who enjoys schedules that follow the day around in 15 minute increments. Some people love that, but it doesn’t work for me. I tend to juggle things, in a constant mental state of triage. So the question about when I clean, what the kids do, and how it happens is something that has no easy answer. It has changed many times through the years. Our kids give up on napping while two. I usually keep them having a “reading rest” for a while after that if possible, and that has long been a time that I use for getting something, anything, done. Blaire is the only napper in our house now, and so the other four are out and about all day – stuffing backpacks full of dress ups, launching complicated scissor work at the dining room table, reading, doing puzzles, playing high speed tag, setting playmobile pieces all over the floor, making a restaurant in their closets with all the duplos they can find, dragging “cozy blankets” through the house to set up caterpillar camp in the living room, and generally living large. I try to keep things orderly mostly by keeping a spot things can go back to. I have greatly enjoyed the help of housecleaners at different times – I have them come when I can turn on a show for the kids, and the youngest is sleeping, then we clean together. It makes me feel like I got on a moving sidewalk. I am still cleaning, at the time when I could have anyway, but I get a lot more done! Sometimes I would leave for the last little bit and run to the grocery store while the cleaner babysat. I have hired younger girls who didn’t mind mopping and vacuuming at night to be date-night cleaning sitters. Kids in bed, we go out, she stays and cleans out the fridge, or the bathroom or something. That was a good idea, and I should start doing it again. The kids help me pick up what they have been playing with, as well as what they haven’t been playing with, and I tolerate quite a lot of daytime mayhem so long as the attitudes are good. When the kids are all being cheerful and having a wheeze of a time with the huge set up all over the family room, I am o.k. with that. Play is their work. As they have gotten older, so has our strategy for teaching them to help. The older four are now capable of good help, so we use it. I don’t want them to just follow directions though, I want them to find their own ways of doing things. Usually when the playroom has gone thoroughly to seed, I call the four of them to report for duty. Then, I tell them to go down and look at the playroom and pick something that looks big to clean up. They have to come report to me what it is that they are going to take responsibility for, and then they go do it. Each of them has to do five different picking up jobs, and our theory is that twenty jobs should always be enough to clean up the playroom. Sometimes for fun I take pictures of the playroom every 5 minutes and we enjoy the slideshow of what they did when they are done. But I think the fundamental thing that helps me deal with this is that I see two of my roles as being very similar, but a little different. I am a housekeeper, sure. The cleaning and the management of basic household flow is my job. But the other side is that I am a homemaker. And a homemaker does what? Makes a home for people. So when the mess is alive and growing in our house, I try to balance the roles of homemaker and housekeeper. Nothing is more homey to children than a rollicking good time. Nothing is more homey goodness to them than being welcome. I don’t mean to give the impression that I am all about maniacal messes. I like the house to be orderly, but I am always trying to find ways to make it hospitable to its first guests, the ones who live with us. This might also explain why I do things like paint a mural (a speedy hustle of a painting job on a Sunday afternoon). I see that as being one of the homemaker kinds of jobs, because it was something that I wanted to give to my girls. It is not indicative that I had a ton of time when every other part of the housework was completed and at rest. The truth is that I probably had some digging out to do on Monday morning. But tomorrow always has more to do in it. Sufficient unto the day are the housekeeping jobs thereof. I streamline some things very dramatically (sometime I’ll tell you about how we have no dressers), and other things I complicate for fun (like getting a sweater for one child done over two weeks and a lot of hours). I keep a tall plastic laundry hamper in the hall closet for all the kids’ jackets, sweatshirts, and outerwear by season. Because they can get things in and out of it, dump it out, pick it up, and stick it back in the closet. Because we don’t have time to hang coats up. Because we want to make a huge mess in the kitchen making pasta. I could write a very lengthy post about the journey to the system that I currently use for the laundry. But I’m still hoping that I can weather the storm of a new baby with the laundry staying on track. The truth is, this is my life work. I’m not supposed to finish everything in one day. I am supposed to get better and better at it. And believe me – there is a lot of better that I could be at it. Summer as found in the iPhone photo library. I enjoyed this post. It was a good reminder that our homes are a place where we live, not a showcase. I love having a home that has an aroma of hearty happiness that is a haven for all my busy people who go out in the world to school or work and want a place to come back to where they can rest and regroup. I actually did get everything done once. I got every task done, every project completed, kids napping…I mean I was DONE! (I only had two children and they were small). It was highly over-rated. About 15 minutes into being “done” I thought that I would like to start a little sewing project. About 15 minutes into that I thought, “Shoot, I’m not done anymore. I’m neurotic!” My next thought was “I’m not suppose to get done. I’m suppose to glorify God and enjoy Him forever.” If I come to despair (which I had) because I never got done, it’s not so glorifying to God. I haven’t been done again in the following 20+ years and it’s good. Now I have to stifle an inward groan when the one bathroom I cleaned has a line up waiting to use it as I’m walking out the door. But–I am a “list-ish” person, so it helps me to at least know what my goals-for-the-day are. If they don’t happen (um…like usually) they get moved to the next day, but somehow…it allows me a sense of “done”. Sad that I have to write them, but helps me remember my priorities. Ok, your plastic hamper idea is absolutely brilliant, and I’m adopting it for this Fall and Winter! Having three boys age four and under, and a sudden, urgent need to have a MUCH more streamlined life has put me on an organizing kick this summer. Thanks! And please do share about what having a house sans dressers is like. I’m very curious! I want to commend you for possibly the most edifying counsel concerning this topic that I have ever read–or heard (both within and without the Reformed community). The Mary-Martha balance you apply and describe in such simple terms, because your daily application has granted you a thorough experiential understanding of it, is simply beautiful to behold. Thank you for your humility, your willingness to share, and for how your words have glorified the Lord. May He bless you and your readership richly. I love this, because I was kinda wondering how you get it ALL done. I grew up in a home where everything had to be spotless and in its place – and there is no way that I could exaggerate on the standard that was required. Being a more “free and easy” person myself, it has taken me a little while to stop feeling like I’m a “bad” housekeeper, because I don’t iron underpants and face washers, I don’t vacuum the whole house everyday (sometime not even every week :-P), and there are endless trails of floor debris consisting of random socks, lego pieces, scraps of recycling (out of the bin!!! ), tiny snippets of cut up paper etc etc – all the handy work of my three cheeky monkeys. For a while I felt as though I had to get ALL my housework done every week, and then felt like a failure because it rarely happened. In the last 6 months I have realised that my house (although not a showcase) is not filthy dirty, and the untidiness is mostly superficial, and so now I just stick to the mantra of “if it’s grubby clean it, if it hasn’t caught my eye it’s fine”. At least now, cleaning is not a big “event” that takes over my week, it just somehow slots in and gets done. Thanks for your words, most encouraging. I am a new reader to this blog, and I just wanted to say “Thank You”. I am blessed to be home full-time with our three daughters, and yet I find myself very *alone* in this journey (in terms of other mom-friends…I’m the only one that does not work outside the home.) This blog really helps me to feel a sense of community, and makes me feel a little less overwhelmed and crazy, too! Thank you! Thank-you for this. I am a working mom of two. My husband wants a couple more but at times I wonder how I would manage to stay sane with two more people to look after. I’d love to hear more about your streamlining! I’m anxiously awaiting to hear why you don’t have dressers and what you do instead…. i am one of those list makers/schedule followers you speak of. 😉 only homeschooling with four kids while pregnant, i find that the list gets a lot shorter. for instance, it has one thing on it. today i am cleaning the bathroom. i don’t care what else happens, that bathroom is getting cleaned. i might have to overlook some of the messes floating around elsewhere, but i’ll worry about that tomorrow. because tomorrow i clean floors. (to clean floors, you have to find them.) i don’t know why, but this gives me a little bit of peace. and it helps me do this juggling you speak of. because there is always wednesday. wednesday i sit down and do something that isn’t “urgent.” like hunting spiderwebs, painting a nightstand that has been lurking on my conscience for half a year, or sewing arm covers for the couch. and at the end of the day,i can say i did something. because otherwise i’m not sure i’d be convinced. which goes a long ways towards floating my tiny lifesaver of mental assurance. Please talk to us about the no dressers–soon! I keep threatening to do such a thing as install a major clothing storage area in the laundry room, but my husband thinks I’m crazy. He’s right. The laundry makes me that way when I find newly clean and FOLDED clothes back in the dirty hampers(or on the hallway floor upstairs). I love the coat closet basket concept, too. You’re so smart! I’m pretty interested in the no-dresser thing, too. What great insights, for a busy mom of 5. I have five also(I’m a grandma now) in 6 years(twins in there too). I would have really loved to read something like this when being a mom at home with them. And I can relate to Katie above, when “outsiders” often dropping in unannounced, would give their “helpful” advice about housecleaning. My older neighbor even told me ,over the fence while I had two babies in my arms and 3 toddlers nearby, that she did not even dust her pictures and frames every day, or even every week. WHAT?? Mine were lucky to see a dust wipe ….whenever the spirit moved me, not often. But then, who cares? And I am so pleased that new Christian Moms can share together and reap from your blog, good values and priorities, that are God blessed, and not “people blessed”.Agree? . Thanks so much for sharing your life and experiences. Thank you for the inspiration! My kids are older, and it would’ve been great to have read this about ten years ago! I have noticed that for so many young moms, their peace of mind comes from ‘doing it right’ according to what ‘should be done’. Once they can let go, worry about ‘doing it right’ unto the Lord and for their family, then things fall in place. We also ditched dressers, and we now use shelves and baskets. We have big wicker ones from Ikea, and small colorful ones from Target – just depends on the particular room and what it is suppose to hold. We all prefer the new method – it reminds me of the difference between using the old sheet/blanket/bedspread form of making a bed to the new duvet/down comforter way. They both work, but one is much more family friendly. Good article Rachel, but oh that laundry it does keeps coming doesn’t it? If this is anything encouraging. My older children now have a day for them to do their own. They don’t see the need to change as often anymore. As for being a “unstructured” person, I can totally relate. No day is the same in our home. My saying is this. “We may plan, but God will do the directing.” I’d be the queen of stress if I didn’t leave ALL to God. May you be richly blessed with your new baby. I may not know you personally but you are blessed. We have nine children and are blessed beyond measure. They certainly are a heritage from the Lord. As for the laundry pile ups, I’m sorry to say they will keep coming. This is the stage of life God has placed you in. Enjoy it to the fullest. Yeah… I needed to read this. That’s really helpful, comparing the house-keeping process to sanctification. Now, the application part will be harder for me, because I’ve become the kind of woman who will re-mop the entire kitchen when a little bit of scrambled egg gets on one spot of the newly-mopped floor. But something I’m realizing is: being a neurotic cleaner isn’t exactly making me less stressed than having a messy house ever did. There’s a balance I need to find. Maybe a big mural that needs to be painted, without regard for the mess I’ll have to clean up afterwards. Thank you so much for this encouragement today!! It seems obvious when you write it, but I love how you tie the continual nature of our earthly work to the continual nature of our sanctification. Blessings to you. This was very encouraging to me today Rachel. Thank you. I was hoping for a daily schedule or a furmla passed down by your grandma but your post was far more helpful. You have helped to correct my thinking – there’s no all done; keep on working; my family are my first guests. Many blessings as you wait for your new arrival. Thanks for the encouragement! This is truly something I’ve been wrestling with for the past few weeks, and you just so simply summed up what I believe the Holy Spirit has been trying to get through my head. We moved to a new state 3 yrs ago, but still own our “old house”. My husbands Aunt and Uncle live there now, and we had the opportunity to go visit them and stay in their home a few weeks ago. His Aunt is one of those poeple who always seems to have “it all done”. The house is perfectly immaculate at all times. A little stressful to stay there with 4 young kids…anyway, I was feeling a little bad about things as I came back home at the end of the week. That house never looked that good when I lived there! The church parsonage where we currently live never looks that good. I was pretty much feeling like a complete failure in the housecleaning department when my young (5 yo) son crawled on my lap one night and said, “Mommy, I liked our old house better when it was dirty. I need to play.” Yep, we are indeed needing to be about the business of making a home for our families; thanks for a great reminder that does not mean a perfectly clean house. I love your comparison to sanctification, and being an ongoing cycle, not something to be completed. Thanks for your transparency in your blogging; it is a true encouragement! I would love to hear your no-dressers system! I only have 3 gems, but we live in a tee-tiny home where space is at a premium. I’d love to create more room for my wee people to run and jump about and create messes in. Great post! Thanks for sharing your life with everyone. It is freeing to hear there is another mommy who does not deal well with the “15 min” schedule. I beat myself up a lot, but there is so much more freedom in Jesus than I give myself. Technically we still have dressers, but they’re the stackable plastic kind that we keep in the closet beneath the hanging clothes – gives us more play room in a house without a playroom. What an encouraging post!! I needed that reminder to be a homemaker: to welcome my little ones as my first guests. I, too, would love to hear laundry streamlining tips! Eliminating steps in the laundry process (sort, wash, dry, fold, organize, put away in the proper room and drawer) would be incredible! Ok, so I posted a comment earlier and I didn’t ask about the Laundry steamlining cos I was thinking, you are having a baby,don’t bother her and so on. But its no good. I have spent the whole day wondering about it and may just continue wondering all night! So please Rachel, please tell us before that baby comes along and your hands are full of better things! yep i hear ya Katie! And because the critisim came from my dutch mother in law it has bothered me more than i ever should have let it. I love this blog because it challenges me to renew my mind regarding the way we view our mothering, and being sweet happy wives. It really is ok if our lounge rooms are the centre of play & learning! Thank you Lizzie for gracious wisdom & advice!! Im off now to tackle a house that is a mess with the vacuum cleaner, and then to decorate a birthday cake. Power on girls! WOW! Loved reading a post that seems completely me. Its freeing! I saw this post linked on facebook by several friends a few days ago and kept forgetting to come read it. I’m glad I did. It is very encouraging to know I’m not alone. I’ve never considered myself a good housekeeper and we live surrounded by clutter, but I have a dream of things being orderly and clean. 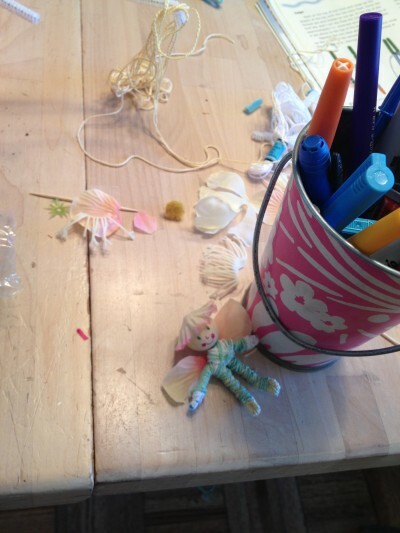 With 4, soon to be 5, ages 6 and under, there is no end to the messes. I’m thankful that my older two are very helpful and thankful that cleanliness isn’t actually godliness. And I’m with everyone else, I need to know more about this no-dresser system. Rachel, I just wanted to thank you for your work in posting these blogs. They are rich,instructive and encouraging. Thank you! I am always encouraged when I read your posts. Mostly, I sense God’s heart of love and delight for his children. Thanks for those reminders. And for the encouragement to keep going. Your children are very blessed to have you as their mama. Thanks for sharing bits and pieces of your life! A husband here… this was a very good (and VERY helpful) read for me. I’m struggling a bit with how best to say what I’m thinking… much deleting and typing over will have taken place by the time I hit the “Submit” button. Our home has gotten a bit more chaotic, with the arrival of our firstborn daughter about 5 1/2 months ago. I know my wife is Chloe’s primary caregiver. I know she takes very good care of me, as well. I just figure if I focus hard, for even a short time when I get home, I can help my wife tackle the laundry mountain, or whatever else needs attention. Even if it’s just for a short time. My mindset is the “getting it all done” variety… and sometimes I am frustrated that more doesn’t get done… but I *NEVER* utter a word about it, for fear that I’ll appear ungrateful. I feel like the work a mother / wife does in the home is FAR more important than what I do in my vocation, even if I’m the one bringing home the bread. The article helps me to understand that this should be ongoing, and we just need to remain diligent, and faithful. Thank you. Please keep writing! I know I’m not the only guy to have read your stuff. “Play is children’s work!” We weren’t raised this way; we were raised to feel guilty if we did anything that wasn’t “productive.” Except for reading, and we were only allowed an hour of that per day. Raising children this way, that they are “first guests” and not a source of free labor is really a paradigm shift. Dressers! Tell us about the dressers! I have to know about the no dressers!!! I remember the moment that I realized laundry was a lot like breathing…you never take a deep breath and then say, “Great! I got that over with, now I can cross breathing off my list.” Until you take your last breath there will always be more breaths to take, and there will always be more laundry to do! Changing my perspective on that really helped me change my attitude toward it. Yes, though you’re a bit busier now, I’d love to hear about the dressers! Loved this! As a mom to 4 kids 2 and under, this speaks infinite wisdom to me. Does no dressers mean…. no folding?!?! I want to hear about your laundry and dresser system! I realized that the way I keep things from going awry is “try to leave the room just a bit nicer than it was when you arrived.” This works for the children too! We still do work items in the mornings after breakfast, but like you said, teaching them to be sensitive and pitch in is far better than structured rules for cleanliness. Or godliness for that matter! Can’t wait to hear about your lack of dressers :0) I love the hamper idea for coats and sweaters. We have a similar system for blankets. Who has time to fold them?! Any tips for someone who has trouble structuring her life and gets easily overwhelmed by housework? I am also curious about the lack of dressers! Please write more on this idea!!! Reading this tonight was like water to a thirsty heart. I find this a daily battle for me to figure out what honoring Christ and loving my little people (regarding housework) should look like for me. What is ‘ideal’ ? And if I were to aim at resting when things are done rest would never come and I’d be one worn out mama…which I am at times as I struggle with this. So please keep letting us hear your thoughts out loud on these things to help us continue to navigate and lay down our lives. Blessings! I don’t know what Rachel does, but we have baskets lined up on shelves with labels on the front (T-shirts, skirts etc…). I shove in the clean clothes and my big girls riffle through them and pull out what they want to wear (ages 5 and 3). We live in England and have very little storage space so my husband lovingly bought plastic boxes and then built appropriate sized shelves in the small (3′ by 4 1/2′) closet. It saves a lot of time both on not having to fold laundry and in the morning the big girls can choose clothes and get dressed while I dress the 1 year old.